Do you have a favorite dip or snack food? One that is your 'go-to' for all kinds of occasions. Or maybe it's something that the kids *insist* on having at every get together or holiday meal or any-ol'-day-of-the-week?? At our house, it's Tex Mex Corn Dip. 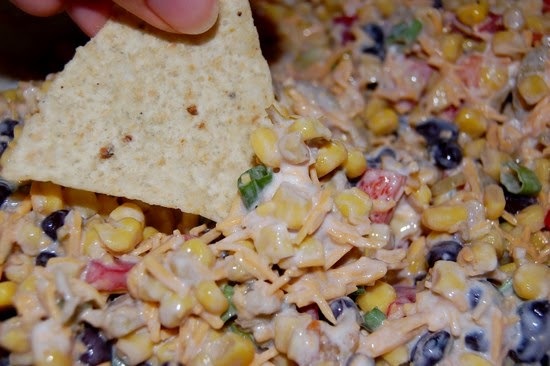 You do need to know - the idea of this Tex-Mex corn dip actually is credited to a friend of mine in Western Kansas . . . She knows who she is - THANK YOU LIZZY!!! I brought the idea home with me and modified it when we had guests and I didn't actually have the right ingredients. Also, I have two versions of this recipe. One uses mostly canned ingredients that you can keep on hand. The other has the option of fresh ingredients and makes a much larger batch (which doesn't even make it through the weekend at our house when the kiddos are home). BTW - don't have a specific ingredient listed? Substitute with anything similar you may have on hand. Betting it'll be just as yummy!! Easy does it - just dump it all in a medium sized bowl. . .spice to taste (spices will get stronger as the dip sits) amd mix well. 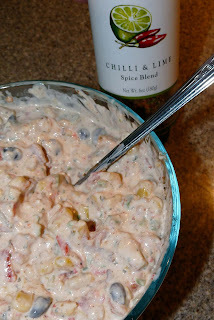 The texture and flavor is best if dip is covered and refrigerated for at least 30 minutes. You can eat it right away though - if you just can't wait - it's very tasty! You'll notice, in the photo, the jar of spices I used. I have no idea where I found that jar of spice, but it is wonderful and I'm on the search for more. It does have lime zest in it, but I still added lime juice too. The roitel I used had lime and cilantro, so I backed off the cilantro as that's a flavor Hubster isn't overly fond of. Mix it all up like in the previous version, let it rest 30 minutes, and enjoy with your favorite tortilla chips! So what about all this jalapeno talk? Are you worried about the biting spiciness? Here's the secret. Jalapenos have a nice spice to them - the bite actually comes from their seeds. So, when cooking, if you don't want that extra-hot, just remove the seeds. That will leave their flavor but remove most of the bite. Oh, when handling jalapenos, their oils will get on your hands and possibly sting. Be extra careful about touching your face or eyes after touching the pepper. Repeated hand washings help - but doesn't completely eliminate the oils. So just be aware. When working with several jalapenos over a duration of time (like when making poppers) we'll use rubber gloves. You'll start with a fresh jalapeno, a sharp knife, cutting board and a jalapeno. Make sure the skin of your jalapeno is firm and smooth with no 'wrinkles' or blemishes. You want one with a nice deep green color. Black 'fadings' are fine as long as the pepper is not soft. You should be able to get a very slight scent of 'spicy hot' when you sniff the fresh pepper before ever even cutting into it. Slice the top stem off, taking about 1/4" of the pepper with it. Then slice the pepped in 1/2 lengthwise. You will find the seeds in either half. I've already removed the seeds from the one half in the photo above. 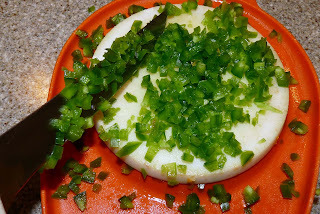 Next, run your knife down, on the inside of the pepper half, each side of those seeds, cutting into the white portion and leaving the green of the jalepeno intact. Remove that 'core' (try not to touch the seeds - use your knife to push them out) and discard. From there, you'll want to lay the pepper down on its back and cut strips. Oh, I might add here. I have found that if I only touch the pepper with ONE hand - never using the other to do any of these tasks, it does help alleviate the risk of rubbing on your face or eyes or. . . . whatever. Now bundle the strips up, even up the ends, and hold the 'bunch' snugly as shown in the photo to the right. 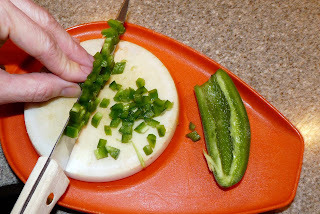 The pepper is fairly firm, but easy to cut with a sharp knife, so you can take small 'slices' at each cut. A nice size for recipes. Move your fingers back, keeping hold of the 'bundle', as needed. Alwayst stay a slice or two (at least) behind the knife. Be careful when at the end of the pepper as is show in the photo to the left. Repeat the process with the other half. To finish, I'll put the diced pepper on the my cutting board and mince by rocking the knife (blade down, keeping the front curve on the board, and rotating the handle) across them to make them a little smaller. Keep your non-working hand off the board and use your knive to scrape the pieces around to further 'mince.' as described. TA-DA! Your jalepeno is ready for whatever you are! Soups. . . dips. . . enchiladas. . . wherever you want to add a little spice. There are those electric choppers and manual mini choppers that you can buy. I find, that many times, they do more mashing of peppers (regardless of the variety of pepper) than actual chopping. They're fine for many things, but I prefer to hand chop and mince most things like peppers, tomatoes, peaches, etc. Those fruits and vegetables with a thicker skin and softer inside are just best cut by hand. And I find it therapeutic to slice and dice into tiny neat pieces. And what about that ugly cutting board in the photos? Yeah. The funny thing is. . . We have three of those. They are over 20 years old (seriously!) and our favorites to grab and cut up small things like that. If there are multiple people in the kitchen chopping - each has their own cutting board. AND - if one is dirty. . .there are two more available. Invaluable when trying to get something together quickly. I especially like the little area around the actually cutting board where you can move the food out of the way and carry it across the kitchen without it falling off. Too bad they are orange. . . ah well. Wonder if they're still being made? Anyone know? Beautiful Blinged Up Box By YOU! This Sweet Box & I Need YOUR Creative Help! !